Hey Guys! I'm here to bring you the lowdown on the SCBWI talk Television and the New Media aka the real deal on your book becoming a movie. The talk was hosted by Eddie Gamara from the Gotham Group, a management production company that brings together film agents, talent agents and book agents. They're concerned with represententing intellectual property, and basically the idea here is being able to express yourself as creatively as you like in as many ways as you like and being paired up with whoever you need to be paired with to achieve your vision. Eddie had a hand in the Tony DiTerlizzi + Holly Black=Spiderwick Chronicles of awesomesauce combo. Eddie's basic thing here was if you're good at more than one thing, than go for that and figure out a way to excel in both things, dream big, think outside the box and explore all possibilities. He would help you move your career across several platforms if that's what you wanted/could do. Onto the important stuff...can your book become a movie???? Here's what you need to know. Hollywood doesn't think the same way we do. First of all, they don't care how acclaimed your novel is, how many awards it's won, how unique or well loved it is. They care about how many books you sell. Because...well, Hollywood needs to stay in bussiness somehow and making movies is expensive. Sell more books or make Hollywood believe you will and you're closer to a deal. Second, having a big concept is the key! Not a big story necessarily, or a big character. Why is the big idea so important? Because the first thought in a Hollywood exec's head is...The MOVIE POSTER! Yep! Have you ever imagined your movie poster? Who would be on it? What would the poses be? The mood? The tagline at the bottom? Third, after a movie poster comes the movie trailer. Their mind jumps next to the BIG moment in a movie trailer. And if your book doesn't have any BIG moments (which trust me, not every book has to have this) then it makes the book turned movie thing a little tricky...though...things can always be rearranged. But what does the trailer show? Mark Wahlberg trying to solve his daughter's murder. Susie's beautiful story is kind of lost in there. Oh yeah....Fourth, men sell movies more than teen girls (often the stars of YA novels). One thing Eddie said was that movie agents think in opposite terms of book agents/editors. In YA novels we often try to downplay the role of the parents or any adults so the hero can actually be a hero and star in their own adventure. But in Hollywood you need big name actors to play those roles to sell your movie. Who's the main character in Alice in Wonderland? Well....who is on the movie poster? Fifth, brands are big and brands sell. If you look at the top movies from 2007 you'll notice a pattern. You get the idea. Now that's not to say that there's no hope for your book becoming a movie if you don't quite see in the terms listed above. And by no means should you change things around. Write the story you want to write, the one you need to write and write it the way you have to do it, full of small moments and important character driven scenes and all (if thats your thing). There are always times when filmmakers absolutely fall in love with a book and bring something beautiful to the screen. Hey! I went to school with Eddie! Cool! I can't envision my book as a movie AT ALL. And, Johnny Depp on the movie poster makes me NOT want to see the movie as much. Because either the poster is lying to me about who the main character is, or they've massively changed the story to make the Mad Hatter more prominent. Neither of those are appealing options to me. Which is why I'm not in the movie marketing industry. Heather, thanks. I never thought like this either, it was really neat though to hear the perspective. And yeah now that I've been following the industry much more closely Im seeing how many books are optioned and go nowhere, which is sad, but yeah. CKHB, Oh cool! Yeah I feel ya. 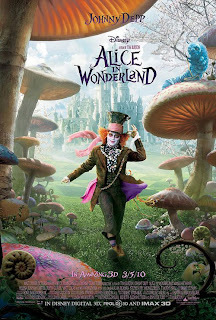 Im curious about Alice in Wonderland, though I still haven't seen The Lovely Bones, Im really worried I won't like it and I really do love Peter Jackson in general, but it seems like he made a lot of choices I don't agree with. It's hard for me to think about movie deals when I don't even have a book deal! I liked this post, though, especially the part about the movie posters (I need to visualize things too). You guys know so much about so much!!! Natalie, well then Im glad I could post the info for you, but yeah not everyone's book fits this criteria but thats ok. WHy should everyone's book be the same. Mariah, hahahaha! I love that. Thanks for the post! Very interesting and good to know.